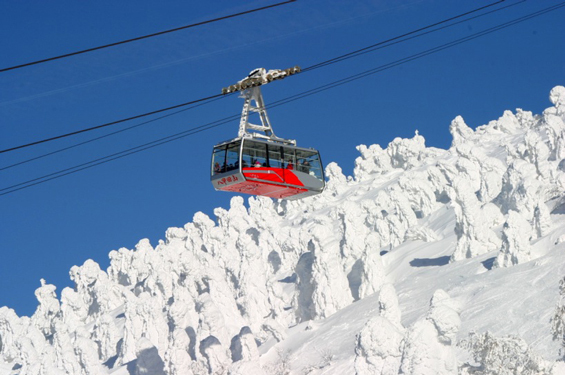 A birlliant cobalt blue sky serves as a backdrop for dozens of snow monsters reaching for a cable car on the Hakkoda Ropeway in Aomori. The cable car rumbles ominously as it carries us from the station in Towada-HachimantaiNational Park up to the peak of Mount Tamoyachi, in the northern Hakkoda mountain range. The dozens of goggled skiers and snowboarders filling the floating glass chamber hardly seem to hear it, as they eagerly approach their chance to begin their exhilarating slide. Although the scenery around us is breathtaking, with a panorama of hills covered in snow and trees sloping gently to AomoriCity in the distance, the sound seems to serve as a reminder of the mountain's hidden power. The white-capped canopy below undulates its way seaward, rising, falling and curving with the lay of the land. It is as though the clumps of snow caught in the branches of each tree are dots that can be connected together into paths and byways for who knows what sort of ethereal traveler. Far down below, I spot a skier weaving his way through the forest. One of the advantages of the Hakkoda range is that the slopes are not too steep, so it is safe enough to whip and wind between trunks all the way to the bottom. This looks like so much fun, but we are not here for skiing. We have come to see the so-called snow monsters, which are said to lurk close to the peak. As we rise higher along the cable, the amount of snow in the treetop branches gradually increases, transitioning from a light dusting to a heavy coating to trunks half-buried in snow. Just before the cable car docks at the station, everything around us is swallowed in a thick mist, making it impossible to tell snow from air. According to the maintenance staff here, the cable car docking bay was cleared only half an hour earlier, but already it is completely encrusted in white frosty crystals, and looks something like the inside of a deep freezer. As we will see shortly, the rapid accumulation of ice on any and all exposed objects here produces other, stranger phenomena. "Judging by how the air feels out there, I'd say the temperature is around minus twelve with the wind chill," says our guide Suzuki, as we put on our rented snowshoes inside the heated station. Once we're ready, he takes us through a glass door and out onto the mountaintop. There, at 1324 meters above sea level, we are completely inundated in the frigid mist. 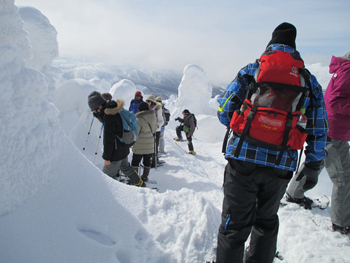 Brave winter souls move among the Hakkoda snow monsters. Around us are the snow monsters. Their eerily misshapen forms burst from the snowy surface we walk upon, like white fists punching for the sky. As Suzuki soon explains, these strange apparitions are a kind of tree called Maries' fir, which have been frozen stiff. In the winter, wind blows supercooled cloud and fog against the trees, which when frozen, becomes an uneven granular coating of opaque ice called rime. This rime completely coats the trees, creating a jagged surface on their windward sides where the moisture first solidifies, and a smooth surface on the leeward sides. Suzuki warns us not to step into the circular depression in the ground around the body of each snow monster. Apparently, these are formed by wind that sweeps around the trees and it is possible to be injured falling in. We are also told to look out for empty pockets where the trees have opened up space to breathe. Yes, these trees, although frozen, are alive and we are advised to move away if we find our feet sinking in (could this be some sort of winter quicksand?). The trees that form the inner frame of these snow monsters are around 6 to 7 meters tall and rise approximately 2 meters above the white surface, which means we are standing on about 4 meters of snow. It is mystifying to think that we are walking through a world of snow in the treetops. We might as well be in a dessert at the bottom of the sea. 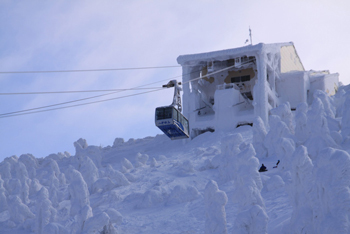 A Hakkoda Ropeway cable car seeks refuge from the snow monsters in the frost-covered station. Because the snow monsters are very sensitive to sunlight and heat, they usually only come out in January and February. Once the season begins to change, they collapse one by one. "If it's nice weather, that probably means it's dangerous," says Suzuki. "On such days, the trees will sometimes just snap under the weight of the melting snow." Soon after he points to the woolen jacket I'm wearing where fluffy white tufts now cling. The hair of a woman participating on the tour has also been similarly frosted, with several strands of what look like pure white threads sticking out of her hood. It is as though these are signs the mountain is embracing us, inviting us to become a part of it. The vistas are gorgeous and the skiing is a thrill, but we cannot forget the latent danger places such as this hold. For example, in the infamous Hakkoda Mountains Incident of 1902, a group of Japanese soldiers from the 2nd Battalion, 5th Infantry Regiment entered these mountains from nearby AomoriCity as part of a military training exercise in preparation for the Russo-Japanese War. The soldiers were soon caught in a deadly blizzard, resulting in one of history's worst mountain accidents, in which 210 men set out and only 11 returned alive. The cable car, the mountain shelters, the guides and all our equipment keep us safe and warm, but we cannot underestimate nature. The rumble on the ski lift, the empty spaces in the snow, the open, inviting arms of the landscape--all these are warnings that we need to take care as we savor the surroundings. If not, we too could become snow monsters, or worse. The Hakkoda Mountain range is located approximately one hour's drive from Aomori City, which can be reached by Shinkansen from Tokyo or plane via Aomori Airport. 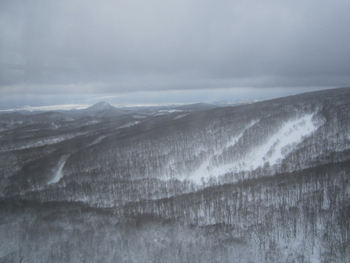 Skiers can head to the Hakkoda Ropeway for slopes, food and souvenirs. Also, the nearby Sukayu Hot Springs Spa, located in one of the snowiest inhabited regions on earth, has a famous mixed gender bath called the "thousand person bath" and is an excellent place to warm up after a day of winter activities.